Digital Music, or commonly known as digital audio, is a method of representing sound as numerical values. In contrast, analog systems like, magnetic tape, or vinyl records, rely on physical methods to reproduce the sound. Download the Digital Audio Questions WORD doc and answer all questions. You May Go to the QUIZLET site and find your class page. Sounds are pressure waves of air. If there wasn't any air, we wouldn't be able to hear sounds. There's no sound in space. We hear sounds because our ears are sensitive to these pressure waves. 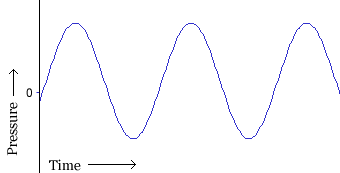 Perhaps the easiest type of sound wave to understand is a short, sudden event like a clap. When you clap your hands, the air that was between your hands is pushed aside. This increases the air pressure in the space near your hands, because more air molecules are temporarily compressed into less space. The high pressure pushes the air molecules outwards in all directions at the speed of sound, which is about 340 meters per second. When the pressure wave reaches your ear, it pushes on your eardrum slightly, causing you to hear the clap. A hand clap is a short event that causes a single pressure wave that quickly dies out. The image above shows the waveform for a typical hand clap. 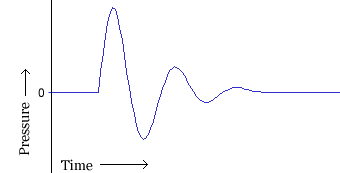 In the waveform, the horizontal axis represents time, and the vertical axis is for pressure. The initial high pressure is followed by low pressure, but the oscillation quickly dies out. A microphone consists of a small membrane that is free to vibrate, along with a mechanism that translates movements of the membrane into electrical signals. (The exact electrical mechanism varies depending on the type of microphone.) So acoustical waves are translated into electrical waves by the microphone. Typically, higher pressure corresponds to higher voltage, and vice versa. A tape recorder translates the waveform yet again - this time from an electrical signal on a wire, to a magnetic signal on a tape. When you play a tape, the process gets performed in reverse, with the magnetic signal transforming into an electrical signal, and the electrical signal causing a speaker to vibrate, usually using an electromagnet. How is sound recorded digitally? In a digital recording system, sound is stored and manipulated as a stream of discrete numbers, each number representing the air pressure at a particular time. The numbers are generated by a microphone connected to a circuit called an ANALOG TO DIGITAL CONVERTER, or ADC. Recording onto a tape is an example of analog recording. Audacity deals with digital recordings - recordings that have been sampled so that they can be used by a digital computer, like the one you're using now. Digital recording has a lot of benefits over analog recording. Digital files can be copied as many times as you want, with no loss in quality, and they can be burned to an audio CD or shared via the Internet. Digital audio files can also be edited much more easily than analog tapes. Samples: The samples contain information telling your computer how the recorded signal sounded at certain instants in time. The more samples used to represent the signal, the better the quality of the recorded sound. For example, to make a digital audio recording that has the same quality as audio on a CD, the computer needs to receive 44,100 samples for every second of sound that's recorded. 1. Sample rate: The rate at which the samples are captured or played back, measured in Hertz (Hz), or samples per second. An audio CD has a sample rate of 44,100 Hz, often written as 44 KHz for short. This is also the default sample rate that Audacity uses, because audio CDs are so prevalent. 2. Sample format or sample size: Essentially this is the number of digits in the digital representation of each sample. Think of the sample rate as the horizontal precision of the digital waveform, and the sample format as the vertical precision. An audio CD has a precision of 16 bits, which corresponds to about 5 decimal digits. Higher sampling rates allow a digital recording to accurately record higher frequencies of sound. The sampling rate should be at least twice the highest frequency you want to represent. Humans can't hear frequencies above about 20,000 Hz, so 44,100 Hz was chosen as the rate for audio CDs to just include all human frequencies. Sample rates of 96 and 192 KHz are starting to become more common, particularly in DVD-Audio, but many people honestly can't hear the difference. Higher sample sizes allow for more dynamic range - louder louds and softer softs. If you are familiar with the decibel (dB) scale, the dynamic range on an audio CD is theoretically about 90 dB, but realistically signals that are -24 dB or more in volume are greatly reduced in quality. Audacity supports two additional sample sizes: 24-bit, which is commonly used in digital recording, and 32-bit float, which has almost infinite dynamic range, and only takes up twice as much storage as 16-bit samples. Playback of digital audio uses a Digital-to-Analog Converter (DAC). This takes the sample and sets a certain voltage on the analog outputs to recreate the signal, that the Analog-to-Digital Converter originally took to create the sample. The DAC does this as faithfully as possible and the first CD players did only that, which didn't sound good at all. Nowadays DACs use Oversampling to smooth out the audio signal. The quality of the filters in the DAC also contribute to the quality of the recreated analog audio signal. The filter is part of a multitude of stages that make up a DAC. How does audio get digitized on your computer? Your computer has a soundcard - it could be a separate card, like a SoundBlaster, or it could be built-in to your computer. Either way, your soundcard comes with an Analog-to-Digital Converter (ADC) for recording, and a Digital-to-Analog Converter (DAC) for playing audio. Your operating system (Windows, Mac OS X, Linux, etc.) talks to the sound card to actually handle the recording and playback, and Audacity talks to your operating system so that you can capture sounds to a file, edit them, and mix multiple tracks while playing. This particular waveform shows the two stereo channels, left on top and right on the bottom. Looking at the waveform we can see that there is a definite "beat" to the music here, which is actually a strong bass drum introduction to a music track. What the waveform is really showing is the volume of the music at time progresses; the larger the waveform, the louder the music. From this we can see that the initial drumbeat in the above example is louder than the following beats. This method of displaying audio is a good way of representing how the audio plays in a visual way and closely matches how audio is stored in a normal uncompressed WAV file or on a CD. Uncompressed audio is stored as a sequence of numbers ("samples") that describe how loud each sample is. On a CD there are 44100 samples every second, so you can see that there are a lot of numbers to be stored for even short pieces of music. There seems to be a great deal of confusion about what is, or is not, legal regarding music these days. People don’t seem to know where the line is between enjoying music from an artist or band that they like, or violating the copyright protection of that same music. Below is a list of common myths associated with buying, sharing and listening to digital music and what the realities are. Myth No. 1: The RIAA will sue you for downloading music. As I mentioned in	a previous column, the RIAA is currently suing only users who share more than 1,000 songs. This doesn't mean that it is legal to download copyrighted music without permission of the copyright owner. It's not (see below). At this time, however, it appears that the RIAA is not targeting people who download copyrighted music. They are going after uploaders, not downloaders, which means that as long as you aren't sharing a significant number of files, the ongoing purge will pass you by. Myth No. 2: Downloading songs for free from the Internet is fine. Unfortunately, with very few exceptions, this is untrue. The songs are copyright protected and the owner of the copyright is owed compensation for the song. If you find music on the Internet for free, the individual or business sharing the music is most likely violating the law and if you download the song without paying for it you will be stealing. Myth No. 3: Downloading copyrighted material without permission is legal. In the interest of fairness, I must point out that downloading copyrighted material without permission is 100 percent illegal. When you download an MP3, you make a copy of that file from a remote location onto your hard drive. Copying the song is the exclusive right of the copyright holder, and doing so without permission is an act of copyright infringement. The fact that you purchased a CD entitles you to listen to the music all you want, but not to share that privilege with others. You can make a copy of the CD for yourself in case you damage or lose the original. You can rip the music from the CD onto your computer or laptop and convert the music to MP3 or WMA or other formats and listen to it on portable MP3 players or other devices. Your purchase of the music entitles you to listen to it pretty much any way you want, but you can’t give copies of it to friends or family. I am not suggesting that you can't *play* the music when other people are around, but that you can't give them a copy of the music, in any format, to take with them when they leave. You can sell or give away the original CD, but only as long as you no longer have any copies of the music in any format (unless of course you have another copy that has been legitimately paid for). You can not copy the CD onto your computer and load MP3’s of it onto your portable MP3 player, and then give the original CD to your best friend because you don’t need it any more. Think of it like you bought a couch. You can use the couch in your living room if you want. You can move it to a bedroom if it works better for you there. You can remove the throw pillows and use them in a different room than the couch. But, when you give the couch to your friend, the couch is gone. You can’t *both* give the couch away *and* keep the couch at the same time, and the music that you buy should be treated the same way. Some people feel that because they would never actually spend the money to buy the CD, illegally copying or downloading it from somewhere else really isn’t costing the artist or the industry any money. Along these same lines, some people may copy or download music to try and decide if they like it enough to buy it, and just never get around to buying it. However, sites like Amazon.com now have clips or samples available to listen to of virtually every song on every CD available. Rather than crossing the ethical line, you should just visit a site like this and play the clips to help you make your purchasing decision. In the end, you may very well find that you would rather buy just one or two songs for $1 each rather than spending $15 for a CD filled mostly with music you don’t care for.